FLINT’S OWN Totem 150 Innovative Health - Summer 2017 /// BY ROBB ANTHONY Independently owned and operated, Totem books is a safe haven for the mind. Opened by Attorney Dean Yeotis in January of 2016 many in the community now consider this a home away from home. 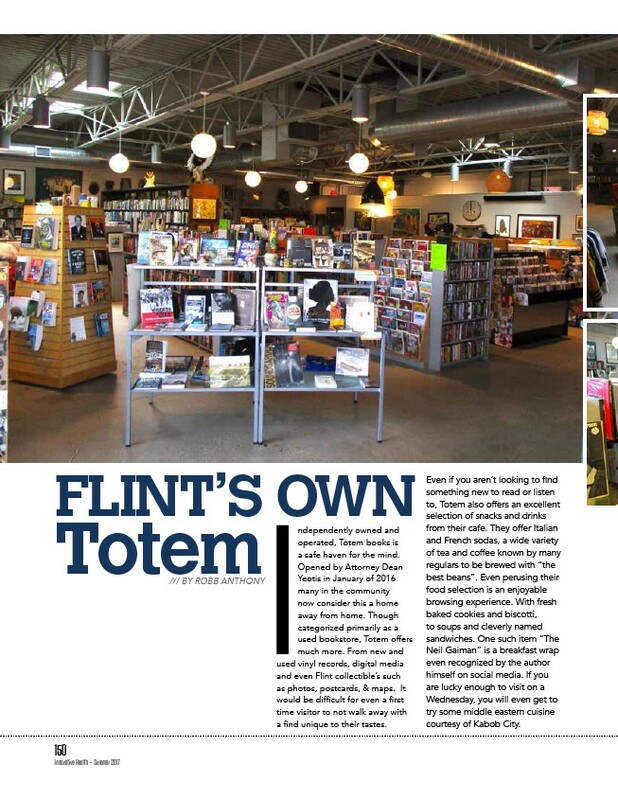 Though categorized primarily as a used bookstore, Totem offers much more. From new and used vinyl records, digital media and even Flint collectible’s such as photos, postcards, & maps. It would be difficult for even a first time visitor to not walk away with a find unique to their tastes. Even if you aren’t looking to find something new to read or listen to, Totem also offers an excellent selection of snacks and drinks from their cafe. They offer Italian and French sodas, a wide variety of tea and coffee known by many regulars to be brewed with “the best beans”. Even perusing their food selection is an enjoyable browsing experience. With fresh baked cookies and biscotti, to soups and cleverly named sandwiches. One such item “The Neil Gaiman” is a breakfast wrap even recognized by the author himself on social media. If you are lucky enough to visit on a Wednesday, you will even get to try some middle eastern cuisine courtesy of Kabob City.